Research shows that over 40% of American households have pets. We all love our dogs for the company and carpets for the comfort and warmth. But then, how to get dog urine smell out of carpets remains a headache, especially for busy homes with more than one dog. Worse is when you have nasal allergies as the smell of dog urine is just as worse as the Fel d1 protein in cat saliva. You will continuously be sneezing and wheezing – pills will be your solace. Well, there has been a lot of conversation around hypoallergenic pets. The truth is that there is no hypoallergenic dog from the fact that urine alone is an allergy trigger. The only option is to learn how to manage your dog’s messes. For pet hairs and skin flakes, the corded vacuums like canisters and uprights as well as the cordless vacuums like stick and handheld vacuums will do a great job. But, the robot vacuums for pet hair are the best because of their automatic operation. You don’t have to be at home for them to work and for some advanced vacuums with Wi-Fi, you can control them remotely. However, one thing that will remain a bother is the smell of dog urine. 3. Use pet odor neutralizers and air fresheners. Today, we want to share with you 5 tips on how to get dog urine smell out of carpets for a fresh, breathable ambiance all day long. There are different types of floor and carpet cleaners. One of the mistakes that often leave stains and consequently a foul smell is using the wrong carpet cleaning machine. The first thing you should avoid is using a steamer. Yes, steamers may remove some dirt from carpets, but then, its intended use is not cleaning carpets. You need to get the right carpet cleaner lest the steam from the cleaner may damage your carpet. Another thing, steam doesn’t remove stains, so it doesn’t make a difference whether you use hot water or cold water – it’s the detergent that will do the work. Now, which is the right cleaner machine for dog urine on carpets? We have regular vacuums, but they are highly specialized. There are vacuum cleaners for shag carpets, vacuum cleaners for deep carpet cleaning and so on. If you are not sure which one to go for, we have reviewed two of the best brands in the market; Rug Doctor vs. Bissell – find out which is the winner. Apart from the regular vacuums, we also have robotic vacuum cleaners. The advantage with these cleaners is the automatic operation. You can schedule it to clean even when you are not at home. Here again, you need to make sure you buy the right robot vacuum for carpets. The Roomba 980 is the best choice courtesy of Carpet Boost; a dedicated mode for high pile carpets. Another advantage of robot vacuums is the filtration systems. Most use HEPA style filters that filter down up to 10 microns while advanced models like Neato have true HEPA filtration systems which are 99.97% efficient and filter down up to 0.3 microns capturing all allergens including the odor causing elements in dog urine. A UV Flashlight Pet Urine Detector will also come in handy when finding those dries urine spots that are invisible to the naked eye. This way, you will be able to vacuum the carpet more efficiently especially when using the handheld carpet vacuums. Most carpet owners go for several days without vacuuming. If you have pets, it gets worse because of the build-up of stains, grime and other dirt including dog urine. However, with frequent carpet vacuum, you can easily maintain a clean carpet, free from dog urine odor and other foul odor causing elements. Another tip, clean all the stains immediately. If you have a carpet vacuum cleaner like Bissell or Hoover, you can schedule vacuuming at least twice a day. It’s also easier to use the stick and handheld vacuum models to clean specific spots where the urine has stained instead of the entire carpet. But to be honest, this can turn out to be a backbreaking task, even if you have the time. That’s why we really recommend robot carpet cleaners because of the autonomous operation. But as mentioned before, make sure you buy the best robot vacuum for carpets. It should also be able to handle pet hair on carpets among other messes. To help you easily manage spills and accidents, go for a smart robot vacuum, and one that preferably has an elaborate floor mapping system. Roombas will let you initiate cleaning instantly from your Smartphone. Better still, you can just tell Alexa you need the house vacuumed, and that’s it. But most cleaners will do the entire house so get something like Roomba i7 series or Neato which have zone cleaning features meaning you can clean specific areas, for example, the carpeted area. Some dog urine stains are so tough and may leave a strong urine odor even after the initial cleaning. In such cases, we recommend cleaning agents and odor neutralizers as well as air fresheners. There are several cleaning detergents that you can make yourself at home, and they will go a long way in keeping dog urine odor at bay. 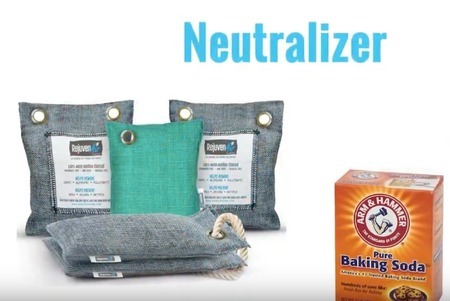 A solution of water and vinegar will go a long way in neutralizing the strong stench of ammonia in pet urine without taking a toll on the carpet fabric. Baking soda will also do the magic. We, however, recommend the professional carpet stain removal solutions as they have been manufactured to clean stains from carpets. Pet odor neutralizers like enzyme cleaners will also help you curb the funky smell of dog urine. Pet Stain & Odor Miracle is one of the best dog urine odor neutralizers. This is a multi-surface formula which is child and pet-friendly. Rocco & Roxie Professional Strength Stain & Odor Eliminator is also another great product, but the Carpet & Rug Institute-certified BUBBAS Super Strength Commercial Enzyme Cleaner Pet Odor Eliminator is the best because it comes in a large volume bottle. These cleaners work to remove the tough urine stains and have ingredients that suppress the foul odor. When using these enzymes and home-based carpet cleaning solutions, test them on a small carpet patch first to make sure they don’t damage your fabric. In this section, we have tried to answer some of the common questions our readers ask us regarding cleaning pet urine stains and how to get dog urine smell out of carpets the easy way. Which is the best carpet cleaner machine for pet urine? With pet urine comes the stains and the foul odor. 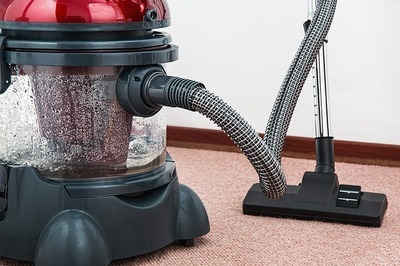 A regular vacuum from Bissell or Hoover may do a great job, but you need to operate it manually. The problem is that they may not reach the tight spots like under sofas. That’s why we have the powerful stick vacuums like Dyson V6, V7, V8 and the V10 which are designed for pet hair and carpets. Robot vacuums, on the other hand, offer the convenience of automatic operation and most importantly, HEPA filtration whereby they capture the allergens that cause bad odor. What is the best enzyme cleaner for dog urine? A professional enzyme carpet stain cleaner is the best, but you can also use home-based solutions. Though there are hundreds of types, we recommend BUBBAS Super Strength Commercial Enzyme Cleaner Pet Odor Eliminator because it is Carpet & Rug Institute certified and comes in a large bottle at an affordable price. Does dog pee ruin carpet? Apart from staining your carpet, there is no other effect of dog urine on carpet fabric. Maybe there may be a mild effect on some fragile carpet fabrics. However, the damage comes indirectly in that the more you scrub urine stains, the more the fabric gets damaged. So, It is important that you ensure your dog doesn’t pee on the carpet. Can the smell of dog urine be harmful? Yes. The stench smells more of ammonia. This stench may be harmful to allergy sufferers as it triggers symptoms like sneezing, wheezing and olfactory adaptation. That’s it for today ladies and gentlemen. 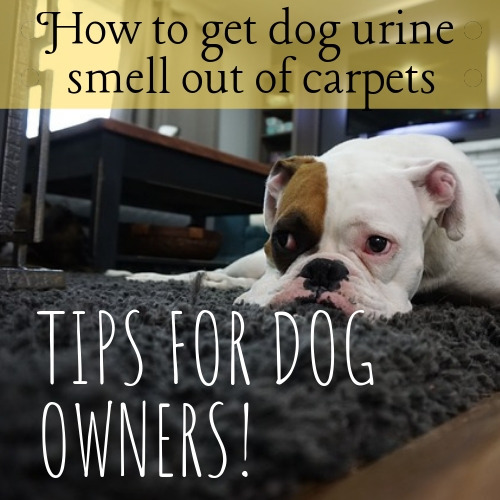 We hope you have found this article on how to get dog urine smell out of carpets very resourceful. It’s our wish that it marks the end of your suffering with dog urine smell on carpets. If your dog was giving you sleepless nights, you now have a solution. Above all, endeavor to teach your dog some manners. Find out how you can get your dog to stop peeing inside, and you will have a stress free life after that. Roomba vs iLIFE Comparison Review How to get Grease out of Carpet?